Magnetite. Image source: Wikimedia Commons. Lodestone is a chunk of magnetite that has become naturally magnetized. The name lodestone comes from the Middle English term “lode” meaning way or journey, making the meaning of the term lodestone to be a stone that leads the way. Lodestone has a unique definition partially lending to the magnetic properties found within this unique stone. The term reflects one of the earliest uses of lodestone as a natural magnetic compass, which was used heavily in navigation. Magnetized lodestone. Image source: Wikimedia Commons. 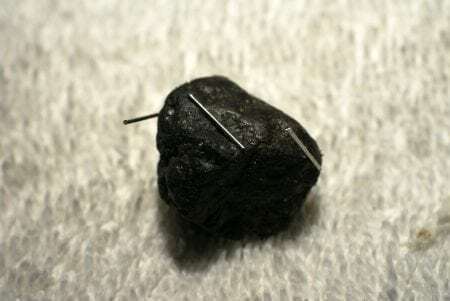 Magnetite is an oxide of iron with the chemical formula Fe3O4. Magnetite is black or dark brown in color, and small pieces of magnetite are found in most igneous rocks as well as some sedimentary rocks. Magnetite can be found in many areas of the world, including South America, Australia, the United States, Europe, and China. High concentrations of lodestone, the naturally magnetized version of magnetite, have been found in Tanzania and have been known to affect compass readings. Lodestone is usually found close to the surface of the earth. As a mineral, magnetite has a crystalline microstructure. This means that the atoms of which magnetite is composed are highly ordered structured into a specific lattice framework. In the case of magnetite, the crystal system is isometric, meaning that the unit cell of the crystal is a cube. The most common form in which to find magnetite is as octahedral crystals. The mineral magnetite is naturally attracted to a magnetic field but is not itself a magnet (i.e. it does not generate a magnetic field). How Does Magnetite Become Magnetic? To become a lodestone, magnetite must be magnetized. Regular magnetite is not formed magnetic, and in fact, most magnetite cannot be magnetized at all. In order for magnetite to become magnetized, it must have a certain crystal structure and chemical composition. Lodestone is largely formed of magnetite, but it also has inclusions of maghemite (oxidized magnetite) and other metal ion impurities. These impurities and inclusions cause the crystal structure of the magnetite to be inhomogeneous and allows the mineral to resist demagnetization once it has been magnetized. It was first theorized that the magnetic field of Earth caused pieces of magnetite to become magnetized to form lodestone. However, it has been found that the magnetic field of the Earth is too weak (at 0.25 to 0.65 Gauss) to cause such a change in the mineral magnetite. Since then, it has been theorized that the magnetite that becomes magnetized to form the lodestones that have been found by humans do so through lightning strikes. Lightning is the result of an electrical imbalance between storm clouds and the ground. The imbalance is unstable and is corrected by the discharge of electricity in the form of an electric current. The electric current appears as lightning because the rapid flow of electrons from the cloud to the ground creates a plasma which emits blackbody radiation as visible light. When lightning strikes the earth, it briefly creates a very strong electromagnetic field. It is this very strong magnetic field that is believed to magnetize magnetite, creating a lodestone. 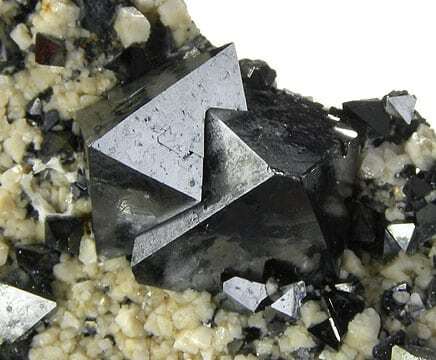 Since lodestones are typically found near the surface of the earth, not deeply buried in the ground, it is very possible that lightning is indeed what provides the necessary magnetic field to magnetize the magnetite into lodestone. In the 1500s, Dr. William Gilbert, who was the first scientist in the field of paleomagnetism (the study of the magnetism of rocks), worked to discover the rules governing lodestone magnetism and the uses of the lodestone, as well as how the properties of lodestone could be studied to better understand the magnetic field of Earth. 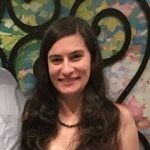 Dr. Gilbert found that magnetization can also occur using heat, in a process called thermoremanent magnetization where an object is heated and then cooled in the presence of a magnetic field. One of Dr. Gilbert’s magnetic instrument, a pivoting magnetized iron needle. Image source: Wikimedia Commons. Magnetism is a force that causes the attraction or repulsion of objects that can be affected by the force field. Magnetism is caused by the spin of electrons in the atoms of a magnetic material. Electrons are negatively charged subatomic particles that have a certain direction to their spin. When an electron is unpaired, there is no other electron to spin in the opposite direction and cancel out the small magnetic field generated by the unpaired spinning electron. If all of the unpaired electrons in a material spin in random directions, then the force of the magnetic field exerted by the material is weak or completely nonexistent. Should all of the unpaired electrons spin in the same direction, however, the result can be a powerful magnetic field generated by the material. As an example, each atom of iron has four unpaired electrons which all have the same direction of spin. When an object that generates a relatively strong magnetic field, such as a lodestone, is passed repeatedly by a piece of iron in the same direction, all of the unpaired electrons in each atom of iron become aligned and cause the piece of iron to become magnetized. For What Purposes Was a Lodestone Used? When a piece of lodestone is suspended from a string and allowed free planar movement, it will align itself with the north-south polarity of the Earth’s magnetic field along the longest axis of the lodestone. Naturally, this property of lodestone has caused it to be used as a natural compass. When a piece of iron is touched with a lodestone, the iron will temporarily become magnetized and also align itself with the Earth’s magnetic field, pointing north and south; this is how the first compass needles were made. 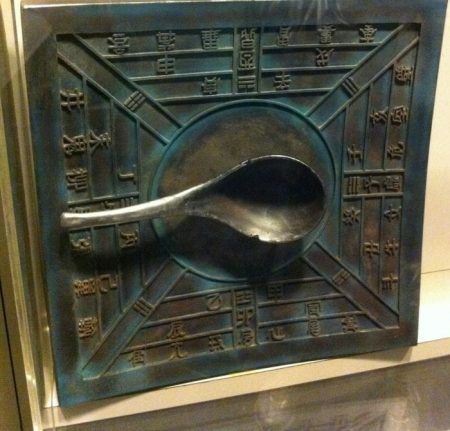 A Chinese compass made of a magnetized lodestone spoon on a bronze circle. Image source: modified from Wikimedia Commons. Since 600 B.C., people have known of the magnetic properties of the lodestone. The ancient Greeks believed that the lodestone possessed a soul which is what gave the stone its ‘magical’ properties. The Chinese used the lodestone not only as a compass but also as a tool for predicting the future. With the understanding of magnetism that we have today, the lodestone is more commonly used as a teaching tool to help demonstrate how magnetism works to students. Through the ages, lodestone has been on an incredible journey with mankind.